As soon as reports began to surface of Mo's plans to hang up his cleats after the season a friend asked me if I had any plans on Sept. 26. At this point of spring training, most of the media already had thrown the Yankees under the bus. They'd say something like, "Look at all of those home runs they lost by letting Nick Swisher, Russell Martin, Raul Ibanez and Eric Chavez get away. They won't make the playoffs without all of that lost power." That made Sept. 26 the presumed last date fans would be able to see Mo pitch in the Bronx. Within a few hours I had my tickets locked up for Mariano Rivera's last hurrah. Six weeks later, those tickets are worth three times as much as I paid. Last Sunday, I paid my first visit to the Stadium this season. The vibe in the Stadium was something I'll never forget; it was something I had felt once before. I had expected it would be just an ordinary game against the Orioles, but there was nothing ordinary about it when the Yankees had a 3-0 lead in the ninth and we, the fans, wanted something more than a Yankee victory. We wanted to see Mo, because it might be our last sighting of No. 42. We wanted starter Hiroki Kuroda to give up a hit in the ninth so we could hear "Enter Sandman" blare from the speakers. But Kuroda had other plans. He threw the first walk-free shutout by a Yankee in the Bronx in a decade. Even with the win on national television to take the series against a division rival, we left disappointed. I left especially disappointed. My friend who wasn't a fan of the Yankees left disappointed. One fan I spoke to who was visiting from Texas left disappointed. Out-of-towners usually despise the Yankees, but this one didn't care if the Yankees won or lost. He was standing there for one reason; he just wanted to see Mo. It was a much chillier experience than the forecast suggested, and I was shivering in my light Yankee fleece. But I stayed until the last pitch hit Francisco Cervelli's mitt anyway, hoping to get a glimpse of Mo. The last time I felt a vibe like this at Yankee Stadium was during an hour-and-a-half rain delay, the night Derek Jeter surpassed Lou Gehrig as the Yankees' career hit leader. 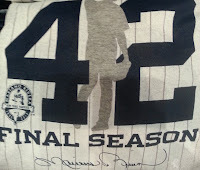 I bought the commemorative T-shirt after Jeter ripped a single down the first base line past a diving Luke Scott. Last Sunday, the Yankees were already selling Mo's farewell season T-shirts. I bought one without hesitation. Despite owning tickets to the last home game, I plan to keep buying tickets until I see the greatest closer baseball's ever seen. And if the Yankees make the playoffs, I'll pay extra to see Mo's last pitch in the Bronx. There will be no boring Yankee games this season, even if you go to see Ivan Nova face the Mariners' fifth starter. There will still be a chance for excitement in the ninth. An unforgettable vibe of a stadium full of fans wishing to see the son of a Panamanian fisherman throw his unhittable pitch one last time.